Automation has changed the way we do science - increasing assay throughput and speed. This Troubleshooting Automation poster provides guidance on how to identify common problems so you can get the best performance out of your liquid handling platforms. Identify common factors that affect liquid handling. Become more proficient in liquid handler use and problem solving. Gain confidence in troubleshooting robotic performance for more control over assay results. 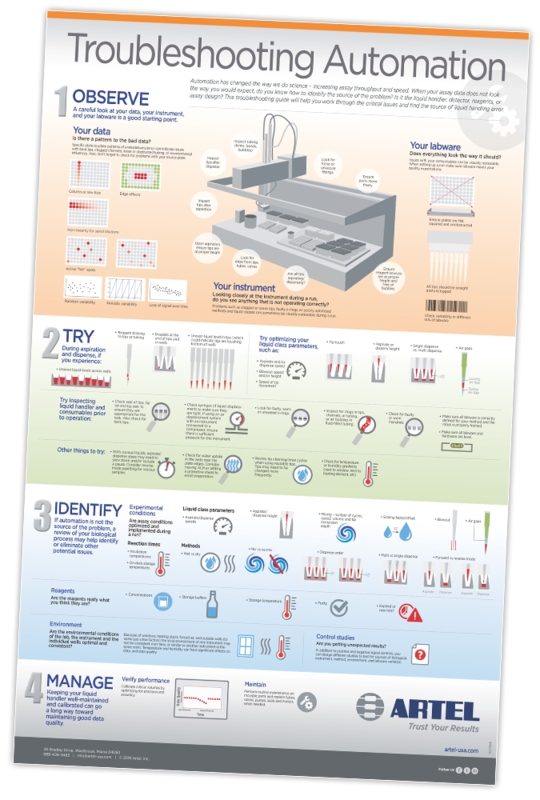 Download the new Troubleshooting Automation wall poster. In the drop-down on the form, you can request a complimentary printed copy of the wall poster for your lab. © Artel. All Rights Reserved.